← Got a toothache and can’t get to the dentist right away? RICHMOND, Va. (WRIC) – Whether it’s the sound of the drill or the thought of an extraction, a lot of people fear going to the dentist, but now there’s a growing trend allowing appointments to be more of a warm and fuzzy experience. “Buster! Hi, baby! How are you doing today?” says Jody Miller as she enters James River Family Dentistry. 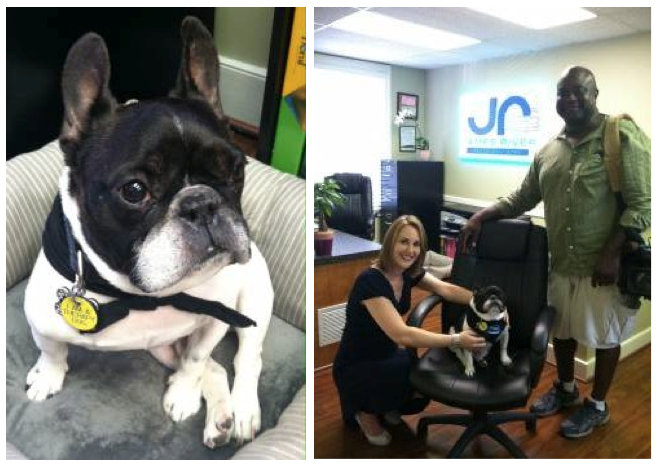 Buster is the resident therapy dog at the Bon Air dental practice. “The holistic happy pill that he is,” Dr. Marci Guthrie describes her French Bulldog who has been on the job a little over six years. She says he has been the best medicine for nervous children and adults who come in for routine visits and more. “Buster is a natural at just reducing anxieties and putting smiles on patients’ faces and helping to reduce their fears of just walking in the door which is half the battle,” says Dr. Guthrie. One study found as many as 20% of Americans do not go to the dentist because of a fear of the unknown, the equipment or another phobia. There is a link between a lack of dental care and Diabetes, Heart Disease, Osteoporosis and other conditions. Now for some patients, dogs like Buster are the gateway to better health. Dr. Guthrie says she has seen all patients benefit, including those with special needs. Post-Traumatic Stress Syndrome, Autism and Down Syndrome are just a few of her patients’ conditions. Buster also recently went to the Mission of Mercy dental clinic for the Special Olympics to help ease patients.